Global Beverage Refrigeration Market size was valued over USD 3.6 billion in 2016 and will surpass 7.4 million units by 2024. Increased beverage consumption is the preliminary driver contributing in beverage refrigeration market growth. Improved availability of refreshment drink varieties coupled with rising health consciousness amongst consumers are enticing people to consume drinks at their home rather than in pubs and other outlets. Further, consumers are investing heavily on specialized appliances that includes milk coolers to retain the quality and flavour of specific beverage for an extended period. Increasing government regulations, for instance new energy standards implemented by the U.S. Department of Energy (DOE) and better eco- friendly refrigerant substitutes required by EPA supports product demand of the companies complying with these norms. Green environment regulations pertaining to raw material and manufacturing processes of refrigerators across the globe will further enhance beverage refrigeration market size. This is due to consumer craving for environmental friendly products. Improved aesthetic appearance coupled with prevention from corrosion are the vital features supporting product adoption in consumer goods industry. Global premium consumer goods including refrigerators were valued at USD 350 billion in 2016, depicting a CAGR of 12% by 2024. 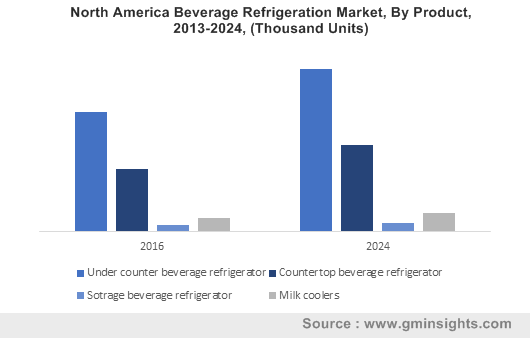 Strong application scope in consumer goods industry will propel beverage refrigeration market owing to the demand for high quality cooling systems. Reduction in overall cooling time along with ease of equipment handling are certain factors boosting industry size. Additionally, increased alcoholic drinks demand among millennial and female population will foster the beverage refrigeration market. Shifting consumer preference for craft beer will result in increased requirement for beer refrigerators with adjustable shelves to accommodate various size bottles and cans. High penetration rate of hypermarkets and supermarkets in the global consumer goods industry, projecting widespread equipment convenience will substantially drive beverage refrigeration market. Global food industry is projected to reach USD 9.5 trillion by 2024, rising at more than 3.4%. Increasing consumption of meat and poultry products will need specialized cooling systems, this in turn is expected to support the product penetration. However, majority of global production are satisfying local demand along with heavy competition from less expensive imported goods from China and Mexico, this can restrain the global market over the forecast timeframe. Under counter beverage refrigerator provides a unique way to regulate drink storage by offering UV protected glass doors to protect wine & other drinks by extending its shelf life and right & left-side handles to match any kitchen layout. These refrigerators can effectively store wine, water, beer and soda. Rising social gathering and private events are supporting the product penetration. Countertop beverage refrigeration market was valued at USD 1.39 billion in 2016 and is expected to surge with a rate of 5.1% by 2024. The refrigerators offer less messy and better space consumption options for users, thereby increasing the product demand among professional chefs and home makers. Distinctive features including bottom freezer drawer and powerful filtered water dispenser, significant technologies invented by General Electric will immensely bolster the market. Fuelling necessity of high-quality preservation milk tankers in dairy shops will propel milk coolers demand over the forecast period. The coolers are manufactured through high quality raw material and state-of-the-art technology with pre-determined quality norms to prevent any possible defect that may damage the product inside. Growing demand of these coolers in school and college cafeterias will boost beverage refrigeration market. Increasing trend of providing aesthetic outfit to restaurants, convenience stores and professional kitchens with a premium refrigerator is anticipated to bolster storage beverage refrigerator demand. Storage beverage refrigeration market was valued over USD 300 million in 2016 and is projected to surpass USD 400 million by 2024. North America, led by the U.S. dominates the beverage refrigeration market and is anticipated to surpass USD 1.1 billion by 2024. Increasing consumer purchasing power along with rise in the capital investment post economic slowdown in the U.S. has propelled the foodservice industry and restaurants in recent years. 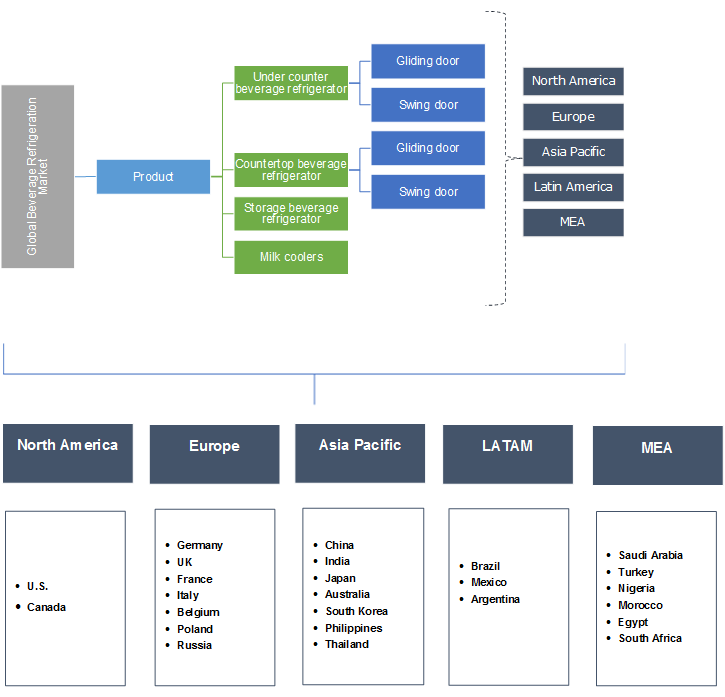 Technical advancements in the product including usage of LED lighting systems, proximity sensors and increased adoption of bounded type cooling units, is projected to accelerate the demand of the U.S. market. Asia Pacific is expected to observe significant growth of 6.1% over the forecast period. Growing retail and food business in the region had led to increasing demand for innovative equipment. Apart from western counterparts, Hydrofluorocarbons refrigeration regulations are not so stiff in emerging economies of Asia-Pacific. In 2014 VI BRICS summits held in Brazil, all the five-member states settled over India’s proposal of not complying with the Montreal protocol for hydrofluorocarbons, unless other cost-effective substitute advancements are offered by the developed economies to them. Until then, the hydrofluorocarbons regulation would be regulated with prevailing Kyoto Protocol. However, the effort to decrease the dependency on hydrofluorocarbons is in process in China. Global beverage refrigeration market is fragmented in nature and is at nascent stage. Most of the major players are indulged in new product launches, technological advancement, mergers & acquisition to improve their profitability and geographical presence. For instance, in 2015, Japanese multinational, Daikin Industries, acquired the refrigeration business of Belgium chemical group, Solvay S.A in Europe. The acquisition allowed the company to expand their refrigerant business in Europe. Prominent beverage refrigeration industry players include Whirlpool Corporation, Electrolux, Daikin Industries, Dover Corporation, Haier, Edgestar, Ford and General Electrics. Other prominent players are Coca-cola, Koolatron, KingsBottle, HABCO, Danfoss, Gamko, Liebherr, Kegco, Marvel, Danby, Avanti, U-line, Allavino, Kenmore, Marvel, Johnson Controls, United Technologies Corporation and Illinois Tool Works. Consumer awareness regarding latest technological advancements in refrigeration for food products along with necessity for prevention from unwanted harmful defects will encourage the global beverage refrigeration market. Rising utilization of energy-efficient and eco-friendly technologies in refrigerators will also attract customers over the forecast timeframe. Rapid urbanization along with varying lifestyles and preferences of the consumers have led to an increased demand for processed packaged foods. Furthermore, factors including time limitations due to hectic work schedule, increasing middle class households and growing number of females in workforce will significantly contribute to product evolution in the forecast timeframe.